In 2005, we finally got “high-speed” internet, which meant 1.5 Mbps DSL from SBC Global (the phone company). It was like magic compared to the 56k dial-up modem we had before. 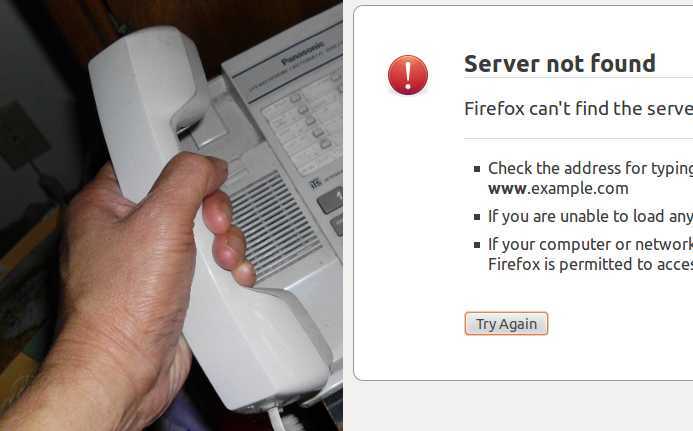 But every time we hung up the phone, the internet would disconnect, and not come back for 30 seconds. At first, I thought that was normal, but later, heard that DSL was supposed to let you conduct your phone calls without interruption of the internet. What we had was an annoyance, but only an annoyance, since we only got a few calls a night at most. Astoundingly, we lived with this issue for seven years, through three Internet Service Providers. Then, in 2012, we switched to sonic.net. It was ADSL-2 service, so they shipped us a new modem. Since it was a transfer from another provider, no one ever came to our house. 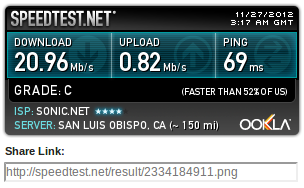 At first, the speed was superb, but it degraded down to between 1.5 and 4.0 Mbps with time. All right, time to debug. Make sure that all phones, including answering machines and auto dial-back alarm systems, have DSL filters. The first thing the internet said to do was make sure that every device on the phone line, except the DSL modem, had a DSL filter on it. Yup. But what about phone jacks that had nothing plugged in? Did they need a DSL filter, too? I put filters even on those, just flapping in the breeze. No difference. The thought crossed my mind that I might have a flaky filter somewhere, so I rotated through several different brands of filters from different sources. No change. 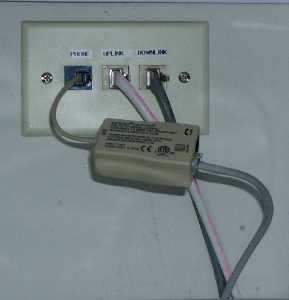 I even tried putting a filter on the modem, using the dual-port filter supplied, and connecting the modem to the “computer” port. It made no difference whatsoever. 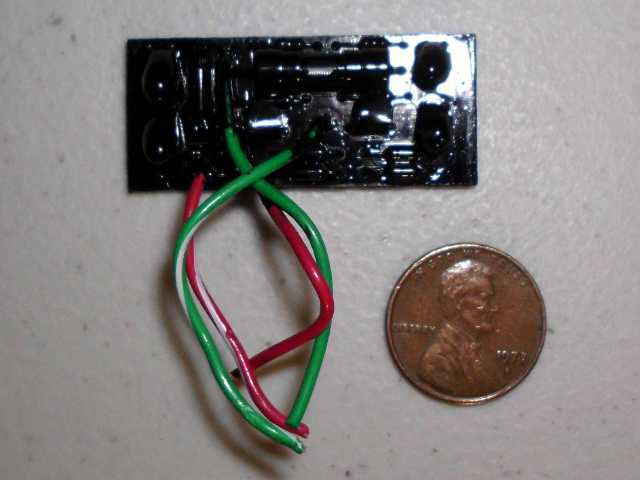 Just so you know, inside that dual port filter, the connection from the plug to the computer port is just a wire. I took the filter off and plugged the modem straight back into the phone jack. Unable to affect the speed issue on my own, I called sonic.net support. The guy there looked at my line, and said that they had a “speed optimizer” on it. What is a speed optimizer? It’s an agent that watches if the line is unreliable, and if so, ratchets down the speed until it is reliable. He said that there appeared to be noise on the line, but said he would disable the speed optimizer. Then he said to try it, while we were still on the phone. I did. Hooray! He warned that whatever was making the optimizer kick in was still there, but that now the problem should be blatant, and easier to find. I was thinking to myself that whatever caused our disconnect problem was likely what had triggered the optimizer. So we went on for a while with blazing fast speed, but still the same disconnect issue. And since it was October 2012, just before highly contested National, State, and City elections, political telemarketers were calling our phone every few minutes. The answering machine would pick it up, and the internet would temporarily go out, all night long. Enough was enough! Time for serious experiments. This is the interface box. 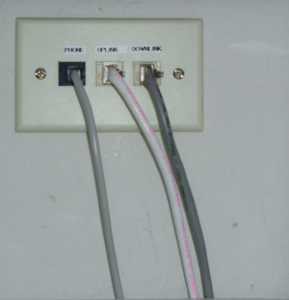 Primary phone line is the jack on the left, secondary line is the jack on the right. Phone company only access section is under the gray cover. 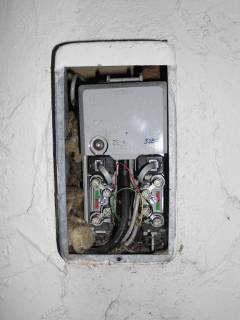 I decided to cut the problem in half – was it inside the house (wiring, phones, filters), or outside? So I went to the Network Interface Device (phone box) outside the house, disconnected the entire house from the phone line coming in, and connected the minimal test configuration sketched below. Basically, it was just one phone, the modem, and a laptop. Test setup to exclude all house wiring. The problem still happened, even that way. I sent an email to sonic.net support, detailing the experiment, and they sent me a boilerplate list of things to try first. If so, is it properly filtered as well? True, we do have wireless phones. But the test configuration had an old-fashioned corded phone. Just to make sure, I unplugged power from all the wireless phones, and only used the corded one. Same problem. Ham radio - Some Ham Radio installations can overpower DSL signals. Fair enough. I didn’t see any amateur radio antennas in our neighborhood, but even if someone was broadcasting, how could it correlate with picking up the phone? No powerful speakers, only little speakers, and they were nowhere near the modem. Happens any time of day, and only when phone is picked up. We can keep dancing around like this, or we can try to figure out what correlates with phone answer and hang up. box includes a device called a Maintenance Test Unit or MTU. At the appointed time, Larry the phone guy showed up. I was prepared to demonstrate my experiment to him if need be, but after explaining the issue to him, he went to the phone box, and used his special screwdriver to remove the No Customer Access plate. He found an MTU in there, snipped it out, and spliced the remaining wires, red to red, green to green. It took all of five minutes. He then said to go in the house and try it. SUCCESS! 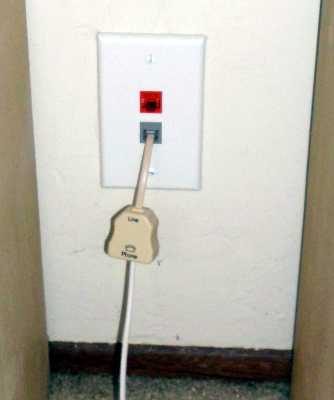 Our DSL had become completely immune to phone pickup and hangup.